Although it’s been running since 2014, this year’s Veganuary seemed particularly influential. Record numbers of individuals signed up to commit to a one month go at the lifestyle that’s been described as better for the planet, animals, environment and people. For many people, it’s not just a temporary lifestyle. In the UK alone there are thought to now be over half a million vegans. Perhaps the most striking impact of Veganuary 2019 was the number of brands getting on board. Veganism was no longer an eccentric niche lifestyle but a mainstream one and many food brands proudly advertised their vegan options. Over the last 10 years, the Vegan Society says numbers have increased 360%, making this a much more sizeable segment than ever before. In the last year alone, there’s been a 38% rise in sales of vegan beauty products, indicating a sudden surge in interest. It’s thought that environmental concerns may be the reason why veganism is now experiencing an unprecedented level of interest from individuals. Brands have also spotted that the people trying out vegan diets are also the ones they’re generally most keen to engage – young and relatively wealthy. Veganism is one way to connect with a generation of consumers that tend to be thoughtful about what they buy and have high expectations for brand accountability. Vegan lifestyles aren’t just about food. 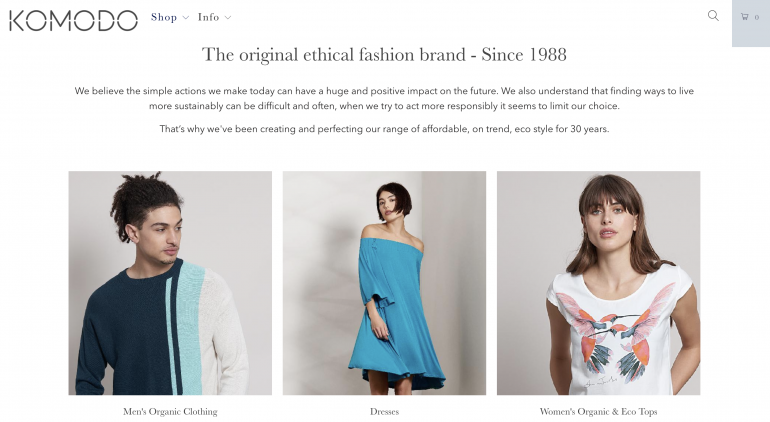 Conscientious consumers are also concerned about the impact of their fashion and beauty choices. Rising consumer concern in issues including sustainability and environmental impact means that consumers are also exploring non-animal-based beauty products. It’s also led to rising interest in alternatives to materials such as wool, leather, horn and shell in clothes, shoes and accessories. It’s not just increased demand for these products that are driving change; supply is also improving apace. Technological and product innovations mean that vegan products are better and more reliable than they were in the past. There are credible alternatives to fur and leather and new resin technologies are replacing materials such as shell and horn in jewellery and accessories. Smaller brands are tapping into the vegan, ethical and cruelty-free trends in order to capture a growing segment in beauty and fashion. Growing interest in the lifestyle translates to a growing user base, which in itself will drive innovation in this area. It’s likely that we’ll see new generations of beauty product being developed simply because rising demand makes the R&D worthwhile. Switched-on consumers tend to be good at sharing information with one another about products and consumer choices. This means word can spread very quickly when a new alternative vegan product is launched. Vegan products aren’t just a special category of their own now, packed in a way that emphasises merely their vegan credentials and sold exclusively in health food shops. Charlotte Tilbury’s widely-praised beauty brand doesn’t heavily advertise that many of its products are vegan and all are cruelty-free. In this product segment, there also tends to be an overlap with another area of consumer interest – natural products. Vegan products tend to also advertise that they contain only natural ingredients. Mainstream beauty brands are now taking vegan beauty much more seriously. There’s a danger of a consumer backlash against smaller brands owned by larger ones that don’t share the same values – for example, Urban Decay is considered by some consumers to be tarnished by its association with parent company L’Oreal. We know the demand for vegan hair products has nearly tripled since 2013 and mainstream retailers are spotting the increased consumer interest in this area. Boots claims that searches on its website for vegan beauty products have doubled in the last year. 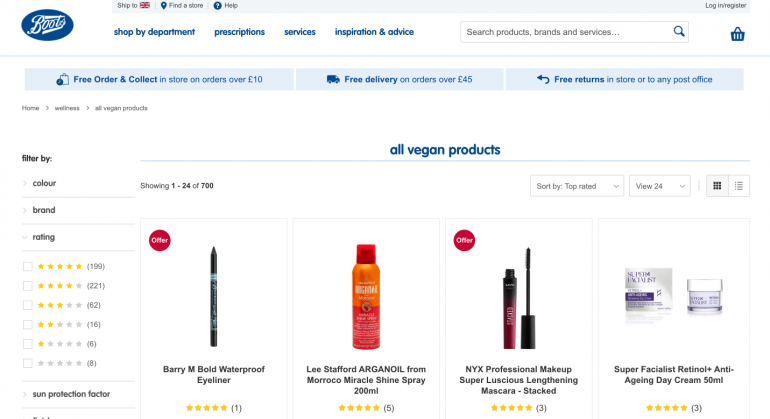 Boots recently created a stand-alone vegan category due to the increase in search queries on its website. There’s a third category of beauty products that aren’t considered vegan but would be classed as ethical or cruelty-free by most consumers. This includes products containing sustainably-sourced honey from Fairtrade suppliers, or lanolin (derived from wool), which definitely wouldn’t be considered vegan. Even if your brand isn’t offering vegan products there’s increased consumer expectation that your animal-derived ingredients are sustainable and ethical. If you’re selling beauty products in China, you’re not really able to market cruelty-free products. You’re only really able to market products that are free from animal ingredients. That’s because all beauty products have to be animal tested in the PRC. In Europe the reverse is true – animal testing has been banned for many years. Nars and Burt’s Bees both experienced a backlash from Western consumers when they announced plans to participate in animal testing in order to sell in this market. Despite its enthusiasm for pork products and affluence-linked rise in meat consumption, vegetarianism and (to a lesser extent) veganism are on the rise in China. The South China Morning Post anticipates a 17% rise in veganism in the 5 years to 2020 and there’s apparently pressure to enable cruelty-free beauty brands to operate in the country. Already interested in products claiming to be based on natural ingredients, this market could yet evolve into one that’s seriously interested in vegan beauty. It seems the interest in vegan products is worldwide and generally expected to grow. In a competitive product segment, brands that are able to meet consumer interest in vegan lifestyles may find they have an edge. Perhaps more significantly, vegan credentials can help brands reach a particular type of consumer: young, affluent and vocal about their choices. This is perhaps the most appealing aspect of the vegan product segment.